The Book Tower is an Italian Renaissance styled tower in Detroit, Michigan. Construction began in 1916 as an addition to the original Book Building and finished a decade later. 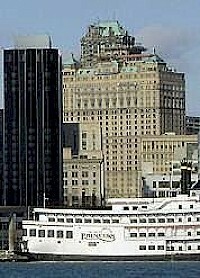 Designed in the Academic Classicism style, it is 475 feet (145 m) and 38 stories tall (not including two basement levels), with two mechanical floors at the top encasing the green copper roof, a roofing style shared by the nearby Westin Book-Cadillac Hotel. 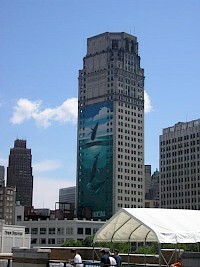 The David Broderick Tower is a skyscraper in Detroit, Michigan that is under redevelopment with an expected completion date in 2010. Construction began in 1926, and was completed in 1928. 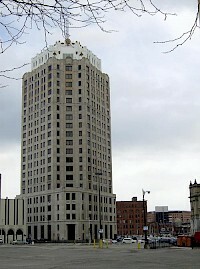 The tower was the second tallest building in Michigan when it was completed in 1928. It stands 35-stories tall, with two basement floors. The building is designed with Neo-classical architecture, Chicago school, and Beaux-Arts designs. Limestone is a prominent material in the building's surface. The Industrial-Stevens Apartments (formerly the "Industrial Building Apartments") in downtown Detroit, Michigan is a high-rise built in 1928. It is located at 1410 Washington Boulevard, and occupies the building block bordered by West Grand River Avenue and Washington Boulevard. The residential building stands 22 storeys tall, with 21 above-ground floors, and one basement level. 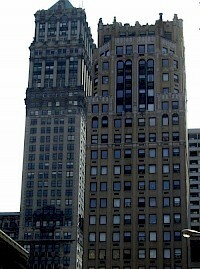 Architect Louis Kamper designed the Book Tower and the Industrial-Stevens (right) both of which are pictured. The Water Board Building is an Art Deco high-rise office building in downtown Detroit, Michigan, located at 735 Randolph Street. It was constructed in 1928 and stands at 23 stories tall. It was built using the Art Deco architectural style, and its materials include granite, limestone, marble, and terra cotta. 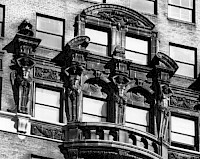 The building was designed by Louis Kamper. The Westin Book Cadillac Detroit is a remodeled upscale high-rise hotel in downtown Detroit, Michigan built in the Neo-Renaissance style. Built as the Book-Cadillac, it embodies Neo-Classical elements and building sculpture, incorporating brick and limestone.